In terms of design, Umidigi follows in the footsteps of the established smartphone giants. 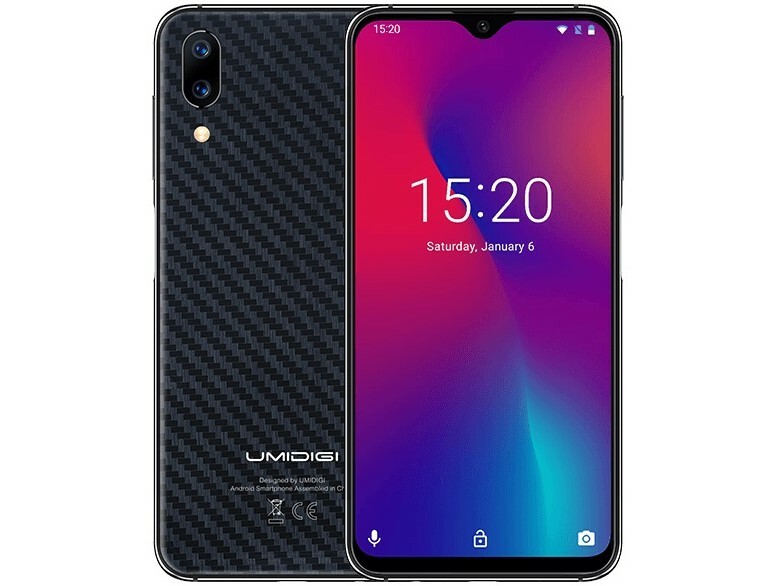 With its 'waterdrop' notch, and twilight colour scheme, the Umidigi One Max ticks all the modern smartphone boxes, but is not afraid to go its own way with a fingerprint sensor on the side. In this article we will explain what potential purchasers can expect of this affordable smartphone from China. ARM Mali-G71 MP2: Integrated GPU that can be found e.g. in the Mediatek Helio P23 SoC with 700 or 770 MHz clock speed. Supports OpenGL ES 3.2, Vulkan 1.0, OpenCL 2.0, DirectX 11 FL11_1 and RenderScript. Non demanding games should be playable with these graphics cards. » Further information can be found in our Comparison of Mobile Graphics Cards and the corresponding Benchmark List. Helio P23 MT6763V: ARM-based octa core SoC (4x Cortex-A53 for power efficiency and 4x Cortex-A53 for performance) for smartphones and tablets.» Further information can be found in our Comparison of Mobile Processsors. 70.73%: This rating is bad. Most notebooks are better rated. This is not a recommendation for purchase.